My daughter and I were looking for something to cook for a quick lunch recently. When I spotted a prolific sage plant in her garden my thoughts immediately turned to the famous and very simple Italian dish veal saltimbocca. This dish, as its name suggests, is usually made with veal but I have done it many times with chicken and it works just as well. On this day we had some free range chicken breasts so I made this one with chicken. 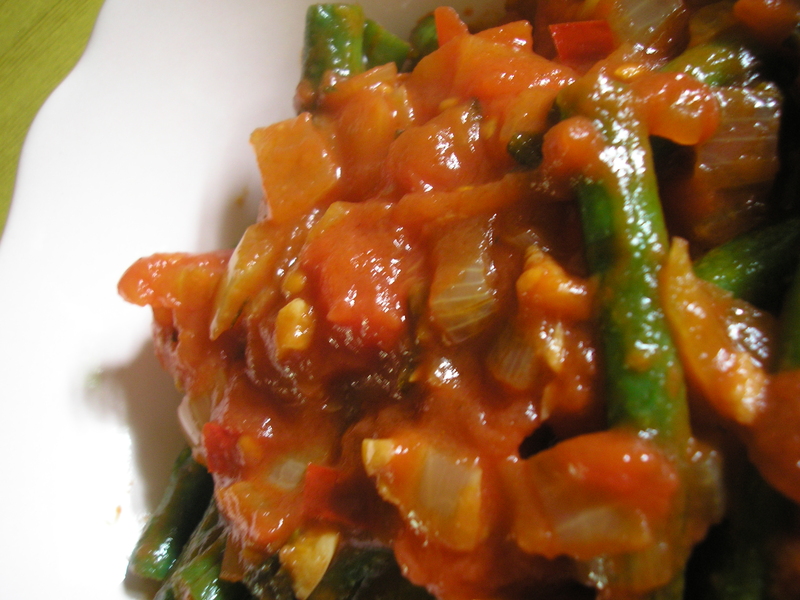 Meanwhile my daughter made a side dish of green beans in a mildly spicy tomato sauce. 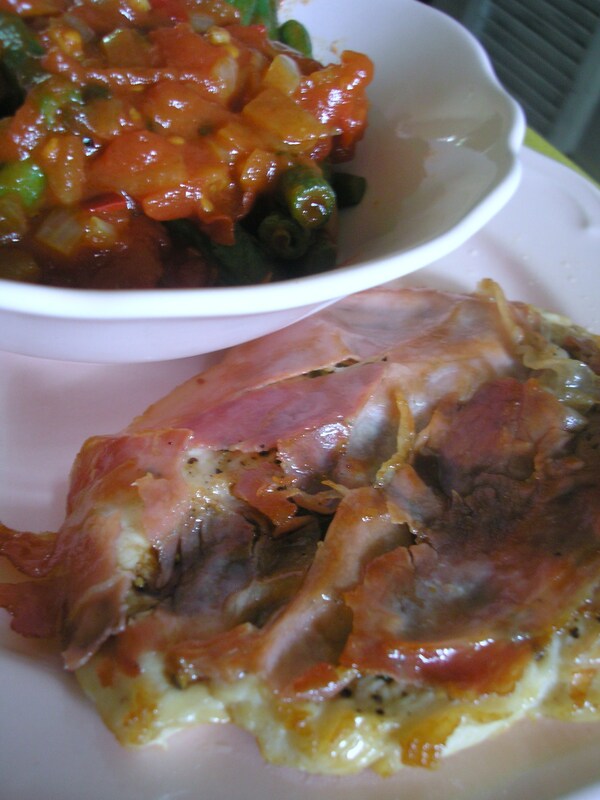 I cooked the saltimbocca at the last minute (it is quite fast to cook) and in no time we were sitting down to a satisfying lunch. Divide each chicken breast into two pieces. Butterfly each piece and place on a board. Put a piece of cling wrap over the top and gently beat out with a meat mallet until the chicken is about 1/2 – 3/4 cm thick. Season each piece of chicken with pepper but no salt as the prosciutto is salty enough. Place 2 – 3 fresh sage leaves on each piece, cover with a slice of prosciutto and set aside. Heat a heavy based frypan and when hot add some olive oil and a little butter. Place the chicken, prosciutto side down, in the pan and cook until the prosciutto is lightly golden at the edges and has stuck to the meat. Turn over and cook the other side until lightly golden, remove from pan and set aside to rest for a couple of minutes. Serve drizzled with a little balsamic vinegar or a squeeze of lemon juice. Heat some olive oil in a heavy based frypan and fry the beans for 2 – 3 mins. Remove and set aside. Add onions, chilli and garlic to the pan and fry gently until the onion is translucent. Add the tomatoes and fry for a further 2 – 3 mins. Add the sugar and green beans, simmer gently for 10 – 15 mins or until the beans are tender. Add balsamic vinegar and fresh herbs, stir through and simmer for another 1 – 2 mins. Serve.